Eurobasket Select has made through 7 games in 7 days with now 7 victories. 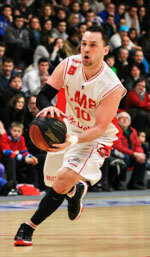 It was not easy as MTV Herzoege Wolfenbuettel, a respected team in Pro B, gave them everything they could handle. Maurice Cole (182-PG-90, college: Dixie St.) opened the game with two 3 point field goals while leading the team with 15 points, but Darvin Ham (196-F-92, college: Northwood) sealed the win with a block shot with 4.8 seconds remaining in the game with Eurobasket ahead by only two. Two free throws from Ethan Murray (188-G-93, college: Coll.of the Ozarks) sealed the 82-78 victory. This was Ham's best game of the tour as he reached his first double-double with a week high 14 points and 10 rebounds. 'Darvin was outstanding on both sides of the ball. He gets out in the open floor as one of our best finishers and is probably our best on ball defender. He makes it very difficult for his opposing players to get a shot off over his length,' Eurobasket Head Coach Allen Mkrtychyan said. After trailing 29-22 after the 1st quarter, Eurobasket turned to their 2nd unit tonight to spark the team. That unit led by Ham and Dayton Mickens (203-F-91, college: Ark.-Monticello). Mickens has been consistent and efficient the entire week as he connected on 5 of 10 shots tonight to go along with 5 rebounds and 2 blocks. Eurobasket continued to trail by 7 throughout the 2nd quarter until a 12-0 run capped by a fast break alley oop from Zack Leeper (193-G) to Ham. The game would remain close throughout the game as we had 11 ties and 7 lead changes in the 2nd half alone. With 2 minutes left in the 4th quarter Eurobasket led 76-75, until Demetrius Ward (188-G-90, college: W.Michigan) put Wolfenbuettel up 2 with a three point field goal right in front of the Eurobasket bench. Eurobasket would answer though after a Bruce Marshall (208-C-94) missed three pointer, Ham grabbed the offensive rebound and put it back with the foul to give Eurobasket a one point lead. On the next possession Joern Wessels would miss a wide open three from the wing allowing Murray to get a diving rebound and kick out to Ham who fed it to a running Marshall who was fouled on a dunk attempt. Marshall would hit one of two to give a two point lead. That is where Ham would finish big as he blocked the 3 point attempt in the corner to secure the win for Eurobasket. Eurobasket will move on to play Pro B team Itzehoe tomorrow at 7:30 pm looking for their eighth consecutive win.